British Beatles Fan Club: The Christmas London Beatles Day is This Sunday! 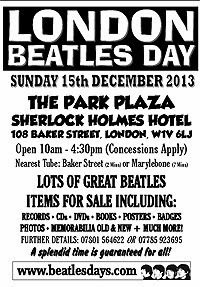 Sunday 15th December sees the Christmas London Beatles Day take place at THE SHERLOCK HOLMES HOTEL, 108 Baker Street, London, W1U 6LJ - which is yards from the former Apple Boutique, and just a 2 minutes walk from Baker Street station (and just 1 Underground stop from Abbey Road) & Madame Tussauds. There will be the usual top selection of Beatles dealers from all over the UK & beyond offering an amazing selection of everything Beatles from badges to books to signed albums & rare original memorabilia, CDs, T shirts, We pride ourselves on the great selection of Beatles vinyl records from around the UK & the world which will be offered from £1 to £1000+ We are pleased to say many new items including records & CDs will be offered since the last show. Grab yourself a Beatles bargain – the perfect place to find that perfect Beatles Christmas gift. We are pleased to welcome Liverpool Authors David Bedford with his brand new book, and welcome back Kevin Roach and all the way from Paris Eric Krasker with his book. Music will be supplied by the very talented FAB TWINS - who played some great songs at our October show. ADMISSION TO THE BEATLES DAY IS ONLY £3 - Doors open at 10am – 4.00 pm – licensed bar & café on site - many food outlets very close by, easy ground floor access for disabled people, remember there is NO congestion charge in London on Sundays, free street parking nearby, nearest Underground/Tube Baker Street.